Welcome to the wonderful world of Cincom Smalltalk. While you are reading these pages, the value, need and desire to use Smalltalk continues to excel. The language that started it all has never been stronger. Smalltalk is a meal with a fine Bordeaux and a petite filet mignonJava is a meal with a cold beer and t-bone. Click here for a Gartner report on using Smalltalk. Our Advantage – Learn about the advantage of using Cincom Smalltalk and what differentiates us from our own competition. Our Present – See what we are up to now and what people are saying about us. Our Future – Check out our Roadmap and see what Cincom’s plan is for Smalltalk in the future and what innovative ideas are lurking in the collective minds of our development team. Our Products – Come and find out which solution we can offer you to meet your business needs. Our Successes – Check out some of our many customers who have used Cincom Smalltalk to continue their own success. Our Services – Even experienced Smalltalkers need help from time-to-time! You don’t need to go it alone. Our Professional Services has maximized productivity for over 40 years through services and support. Our Support – Need support now? Just want to search for an existing solution to a problem you’re having? We’re here to help. 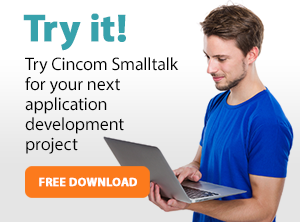 Our Developers Community – Cincom Smalltalk supports a diverse range of developers, across commercial projects, non-commercial projects, academic research, and education. Check out our growing Developers Community. Cincom enterprise technologies include contact center software, document automation software, manufacturing software, product configuration software, healthcare software, database management software and application development software. Each software solution is rigorously designed for simplicity, ease of use and flexibility. Rapid implementation means you get value from our solutions faster, with less cost and risk. In the end, we realize that the greatest value we offer is to deliver a great experience to your staff and your customers. No one does this better than Cincom. For over 40 years, we have served thousands of large enterprises and small to medium-sized growth businesses around the world. Ninety-four percent of our customers rate us highly, and nine out of 10 recommend us. Perfection is the standard, and we pursue it with enthusiasm.Cincom World Headquarters is located at 55 Merchant Street, Cincinnati, Ohio. Want to learn more about Cincom and its storied history, please visit our main website.